We are very happy to announce that Immortal Performances has re-mastered the entire Dream Ring, enhanced with improved sound, greater clarity and impact as well as more natural tone. (In some instances we have utilized new sources.) The albums offer new covers and other production values including many additional photos and revised texts. The broadcasts include commentary and curtain calls by Milton Cross. Click here more information about the improvements. The price for the complete Dream Ring is a reduced rate of $150.00 Canadian dollars ($12.50 per disc), plus postage. If you order each album individually, the price is $14.50 per disc (which would total $174.00), plus postage. For an additional charge of $15.00, the complete Ring set will come enclosed in a custom-made, color-illustrated box. Click here to view picture of box for Ring set. To learn more about each individual CD album, and read some of the reviews written about the previous, un-remastered editions, click on the album that interests you. Please go to the bottom to order. The Dream Ring assembles the great voices chosen by the major music critics as the supreme representations of the central roles in Wagner's Nibelungen drama. These artists often sang together in the same performances, but the cycles offering their singing were never completely recorded. Nevertheless, the traversals of their roles were separately preserved and it is these recordings that we have brought together to create as ideal a performance of the Ring Cycle dramas as it is possible to achieve. The albums deliver Friedrich Schorr's Wotan, rich with humanity, intelligence and grandeur. Melchior's heroic and incomparable Siegmund and Siegfried, Kirsten Flagstad's noble and shining Brünnhilde, Lotte Lehmann's rapturously feminine and unforgettable Sieglinde, Karen Branzell's regal Fricka, Kerstin Thorborg's prophetic, richly toned Erda and Waltraute, Eduard Habich's implacable and spirit-curdling Alberich, Karl Laufkoetter's wheedling and pathetic Mime, all in the complete traversal of their roles. Their capacities to embody the essential character in their tone gives us the very soul of their emotion, achieving an unforgettable impact. Wagner longed, not only for the invisible orchestra, which he finally achieved at Bayreuth, but for the invisible theater. In the dream Der Ring des Nibelungen one can experience, then, in the vast theater of our minds, these epic dramas with a verisimilitude without parallel in recorded performances. These albums also include extensive booklet texts about the composer, singers, the performance, the work, together with biographies, detailed Recording Notes as well as photographs of the singers in their roles. 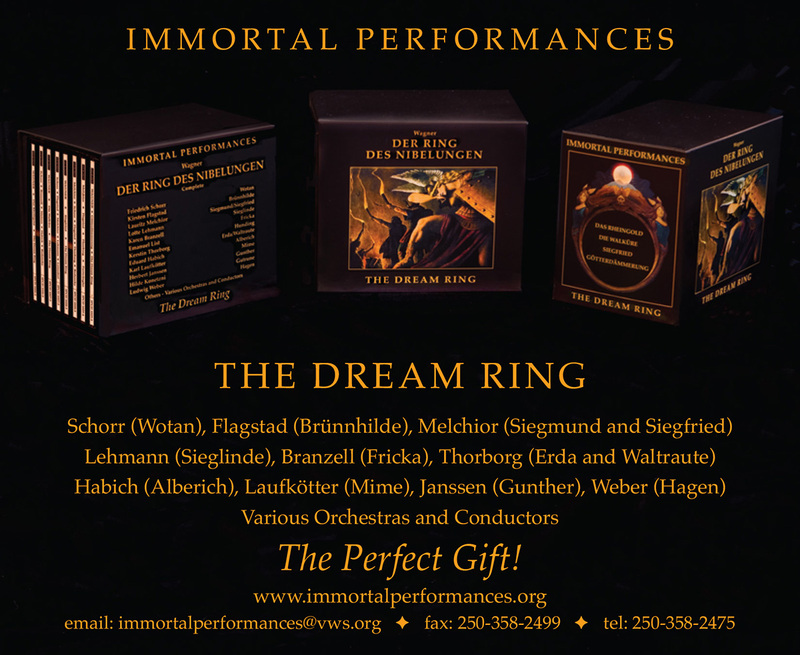 The Dream Ring is presented in a newly re-mastered edition, offering in many instances improved sound, preserving performances of Der Ring des Nibelungen you will never forget - truly a dream come true. Issues like the Immortal Performances Ring give hope for all. Richard Caniell’s super-project is an astonishing achievement and one that deserves to be roundly applauded. Building on previous releases, and presented with trademark documentation (i.e., lots of it), this is thought-provoking, stimulating, and a reminder of Wagner’s achievement as much as Caniell’s. "This is a Ring to die for . . . a significant achievement in recorded history . . ."
"A remarkable achievement – A Ring Cycle for the ages with the greatest Wagnerian voices of the century . . . this edition is a meaningful improvement over Caniell’s own earlier version (on Guild)."